Once during your turn (before your attack), if Cascoon is your Active Pokemon, you may flip a coin. If heads, search your deck for a card that evolves from Cascoon and put it onto Cascoon. (This counts as evolving Cascoon.) Shuffle your deck afterward. 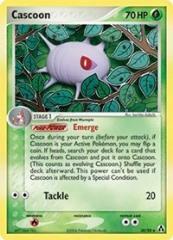 This power can't be used if Cascoon is affected by a Special Condition.